This year, the main attraction at the Spanish manufacturer of all-terrain compact industrial vehicles was the the DR1001AHG, an innovative 10 t dumper featuring reversible driving, hydrostatic transmission and a closed cab. 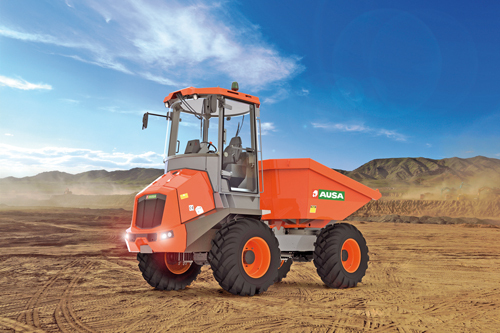 With this new dumper, AUSA is positioning itself among the segment leaders in the area of safety. The driver’s cab can handily rotate 180°, providing a huge increase in visibility, which proportionally increases the safety of the operator and their environment. In addition to the rotating fully-closed ROPS/FOPS driver’s cab with heating and a seat belt buckle sensor, the dumper is equipped with a front camera, an audible reversing alarm, 2 rear-view mirrors and a safety grille. Furthermore, the new DR1001AHG maintains the features introduced by the successful D601AHG, such as the ECO Mode, Smart Stop, Hill Holder, digital screen with all of the machine’s information and integration of the telematic systems, which makes it one of the most advanced compact dumper in the market.